Monroe Creek Crossing Bridge — Engcomp. Stay Curious. 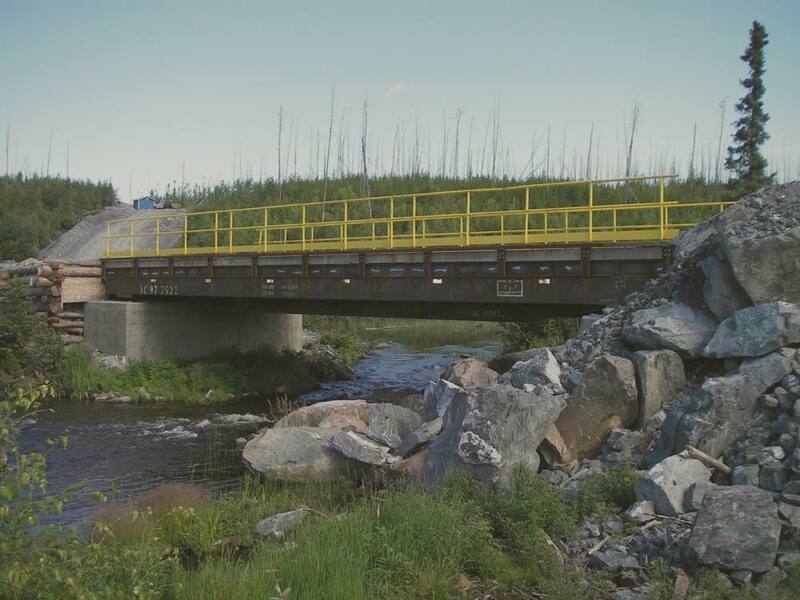 Completed in 12 months from start of engineering to completion of construction, this innovative design provides a practical, cost-effective solution that safely meets the requirements of CRI, the highway bridge code, and the Department of Fisheries and Oceans. Ongoing exploration by CRI uncovered significant gold deposits (Santoy Mine) at a remote location from the Seabee Gold Processing Facility, 150 km northeast of La Ronge (Saskatchewan, Canada). Access to this mine requires crossing Monroe Creek. Discussions with the Department of Fisheries and Oceans (DFO) concluded that a bridge was required to make the crossing in order to protect the spawning habitat of Monroe Creek. CRI hauled two decommissioned flat-deck rail cars to the site in the winter of 2004/2005 on the ice roads. Engcomp's initial mandate was to evaluate the rail cars for strength and provide recommendations on the viability of using them for the bridge. The results of this phase were that even though the cars required a significant amount of work, it was feasible to use them for the bridge construction. The design process included the use of 3D CAD modeling tools and 3D structural analysis software in order to execute the complex engineering project. Design for CAT 773B 50 Tonne Capacity Mine Haul Truck. Total design load = 260,000 lbs unfactored. Design the abutments to accommodate a 2m clearance between the bridge and the high water line in order to allow for canoeists to pass under unobstructed. Use the existing salvaged rail cars as the main support structure for the bridge. Meet the requirements of CAN/CSA S6-00 Canadian Highway Bridge Code. Many design options were considered, and changes to the design criteria were made to minimize budget and optimize schedule. First site visit in June 2005, to assess the condition of the rail cars. The final installation was complete 12 months from start of engineering, with gaps in between to accommodate onsite operations. The bridge was opened for use with light vehicles within seven months of the project start, allowing personnel and exploration equipment access to the mine site through the winter. The bridge was operating several months sooner than if the rail cars were not used for the construction since new materials would have needed to be hauled in over the ice roads. Met the requirements of the DFO. Was awarded the 2006 Brian Eckel Award of Excellence by the Consulting Engineers of Saskatchewan.